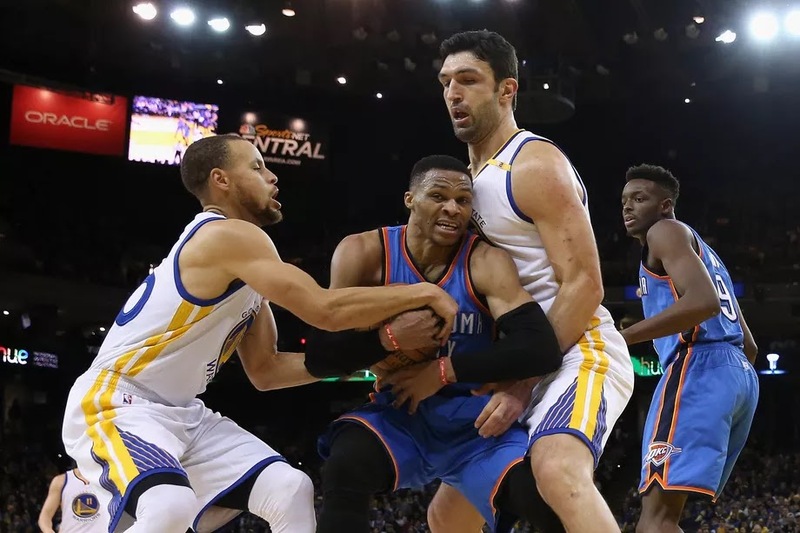 Entering the season, the Golden State Warriors vs. Oklahoma City Thunder matchup was one the world wanted to see. Here was David vs. Goliath: Russell Westbrook running rampant with his cast of others against a proverbial group of Monstars, who somehow put an ex-MVP in Kevin Durant alongside the two-time and reigning award winner, Stephen Curry. Everyone, save for Warriors fans, pulled for the upset. But Oklahoma City’s slingshot hasn’t been strong enough, and quite frankly, it never will be. When Durant first returned to Oklahoma City on Feb. 11 as a member of the Warriors, the thought was simple: Maybe the emotions would carry Westbrook and the Thunder to an improbable victory over a powerhouse team that swiped their best player to compete for an NBA championship. The Warriors had already bludgeoned the Thunder by 26 and 21 points, respectively, in their previous two matchups in Oakland. Maybe the emotional lift at home was what Oklahoma City needed to jet the team forward. Whether or not the Golden State Warriors are actually “furious” that the Oklahoma City Thunder showed insufficient respect for Kevin Durant during his first return trip to Chesapeake Energy Arena last month, it’s clear that there’s still very little love lost between these two teams. That stands to reason: they contested a hard-fought, seven-game Western Conference Finals last year, stood as victor and vanquished in the biggest free-agent acquisition of the summer, and had lined up for three of the most emotionally fraught (if ultimately one-sided) games of the 2016-17 regular-season campaign. With 5.3 seconds remaining, Warriors superstar Stephen Curry and Thunder reserve Semaj Christon were jockeying for position ahead of the referee’s toss of the jump ball. That jockeying turned into jousting, as the two players slapped at one another before pushing and shoving. Westbrook — who recently responded to Curry’s pick of James Harden as this year’s NBA Most Valuable Player by asking, “Who’s he?” — quickly got involved, stepping between Curry and Christon before turning to go nose-to-nose with Steph. That drew the ire of Warriors big man Draymond Green, who made a beeline for Russ to make sure that his MVP point guard didn’t wind up bearing the brunt of any altercation. Hey, Thunder? Might want to make sure you keep tabs on No. 30 in blue. He can shoot it a little bit. Curry’s buzzer-beating triple — and subsequent race to the locker room — gave Golden State a 20-point lead at intermission. The Warriors wouldn’t relinquish it, taking it to Oklahoma City in the third quarter and leading by as many as 27 before calling off the dogs en route to a 111-95 win, their fourth convincing victory of the season over the Thunder, this one coming without injured superstar Kevin Durant. Klay Thompson led all scorers with 34 points on 12-for-21 shooting, including a 7-for-15 mark from 3-point land, to go with six rebounds, two assists and two steals for the Warriors, who improved their league-leading record to 56-14 and now hold a 2 1/2-game edge over the San Antonio Spurs for the No. 1 seed in the Western Conference playoff chase. Curry finished with 23 points (8-for-17 from the field, 7-for-12 from deep), six assists and four rebounds in just under 30 minutes; he didn’t set foot on the court in the fourth quarter, having done his damage in three to help Golden State sweep its season series with the Thunder by a total of 79 points. Victor Oladipo scored 17 points to lead five Thunder players in double figures. Westbrook finished one of his quieter outings of a remarkable season with just 15 points on 4-for-16 shooting, eight rebounds, seven assists and two steals in 27 minutes. He, too, sat out the fourth for OKC, who fell to 40-30, tied with the Memphis Grizzlies for the sixth-best record in the West and one game behind the fifth-place Los Angeles Clippers. After Steph Curry predicted James Harden would win MVP, and after Russell Westbrook responded by asking "Who's he? ", Curry was asked if he wanted to continue the dialogue. He took the high road. His answer: "I don't have a response to him. But like, if you ask anybody, they'll probably have an opinion on who they think [will win]. Whether you agree with it or not, it's not, obviously, my decision. But I try to stay from those Twitter, social media, interview wars. It doesn't do anything for me." Then, Monday night, he doubled back and set Russell Westbrook on fire. Curry had 17 points in the first two quarters against the Thunder. He got to the rim, he was hitting from outside, he started getting chippy, and then he finished the half with what's gotta be the most demoralizing jumper of the year. With Golden State up 20, the game was effectively over at halftime. For his part, Westbrook struggled. He was 4–16 from the field with a –25 plus/minus. Dating back to last year's Conference Finals—when he couldn't hold back laughter during a press conference question about Curry—Russ has now lost seven straight games to Steph. Curry finished with 23 points, and spent most of the third quarter throwing alley-oops to JaVale McGee and hitting Klay Thompson (34 points) for open threes. "He" did not have to play the fourth quarter. Curry needed a game like this. Until the last five or six days, he's spent the whole season searching for a rhythm that he's never quite found. He's shooting below 40% from three for the first time in his career, and he's spent a sizable portion of the past month missing open looks like a golfer who's got the shanks. In the middle of one of the best MVP races ever, the back-to-back winner is not even in the conversation. He probably won't make All-NBA first team, and there was minor outrage when he was voted as an All-Star starter. This version of Curry is still a star, and he still leads the NBA in plus/minus, but he hasn't been the player who took over the world last year. On the other hand, it's a long season. Aside from glorious, spectacular revenge—Petty Curry at his finest, as Rohan Nadkarni wrote—Monday was also a reminder that Curry will still determine everything Golden State can be over the next few months. Here is where I admit that I was bummed when Kevin Durant went to Golden State this summer. Durant going to a team that had just beaten him felt like sports blasphemy, and had he gone somewhere like Boston or stayed in Oklahoma City, it would have added a title contender to the league and made the whole sport more interesting. But all those objections faded, and I got used to KD in the Bay. There's just one thing that still bugged me about the KD decision, and it centered on the MVP who helped recruit him. What Curry did the past two years was not an aberration. He was better than anyone in basketball, LeBron James included, and he expanded the game in ways that nobody had imagined possible. But through it all, he never quite got the credit he deserved. When the Warriors won their first title, it was explained away as luck. When the Warriors were tearing through the regular season, there was a new retired player popping up every week to say they wouldn't have done this in past eras. And when Curry and the Warriors gave away the Finals, it seemed to confirm all the skepticism. It turned into a nationwide 3–1 lead joke. All of that's fine. If Curry's graded on a different curve than various peers, the same has been true of plenty of Hall of Famers. Dirk was soft for the first 10 years of his career, and then he wasn't. LeBron wasn't clutch, and then he was. Kobe couldn't win without Shaq, and then he did. They all had the chance to prove the world wrong. When KD went to Golden State, I worried that Curry would never get his. Now I'm not as worried. The fear was that Durant would upstage Curry, and all their accomplishments would come with an asterisk. But even with KD, anyone who's watched Golden State this year knows that Curry is still the one who can put them in a different category. If the door is open for Warriors challengers, it's Curry who'll have to close it. Beyond OKC Monday, go back to the Cavs games. The difference between a Christmas Day loss and a 35-point January win was Steph, not Durant. He was 4–11 for 15 points on Christmas, and he was benched at the end of the fourth quarter. Then he came out firing in January and finished with 20 points and 11 assists, and like Monday, the game was over by the second quarter. As Steve Kerr said afterward in January, "When he's aggressive, we go." That lesson will be the theme of the second half of the season. In a year that's been dominated by Russell Westbrook, James Harden, Kevin Durant, and LeBron James, the story may still come back to Steph. When he's decent, the Warriors are good. When he's good, they are great. When he plays like he did Monday night, nobody else matters. 0 Response to "Warriors vs. Thunder isn't a rivalry until Oklahoma City actually wins"